During a ribbon-cutting ceremony held yesterday at Naval Air Station (NAS) Corpus Christi, officials from the United States Navy and CAE USA officially inaugurated two new T-44C flight training devices delivered by CAE. 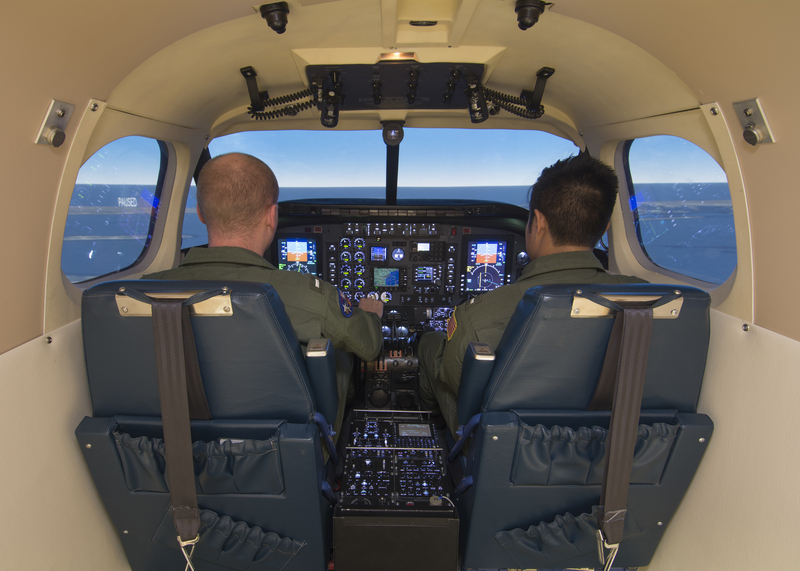 The T-44C simulators are the first two of six new training devices that will be delivered by CAE to support comprehensive T-44C aircrew training services for the U.S. Navy, Marine Corps and international students. The T-44C aircrew training program falls under the responsibility of the Chief of Naval Air Training (CNATRA), headquartered at NAS Corpus Christi, Texas. Earlier this year, CAE was awarded a long-term contract to provide T-44C aircrew training services under a contractor-owned, contractor-operated training services program. The Navy recently exercised the contract option for the second year of training services provided by CAE. "Simulators are a critical component of our providing the best and fully trained aviators to the fleet in an efficient and cost-effective manner,” said Rear Admiral Roy Kelley, Chief of Naval Air Training. The new T-44C simulators were delivered in less than 12 months and feature a full-fidelity T-44C cockpit representing the latest digital glass cockpit avionics suite being used to upgrade the Navy’s fleet of T-44C aircraft. The T-44C simulators include comprehensive visual and display systems that generate a realistic, immersive synthetic environment. As prime contractor on the T-44C aircrew training program, CAE provides classroom and simulator instruction for more than 500 students annually at NAS Corpus Christi. As part of the T-44C aircrew training program, CAE is providing a suite of new T-44C training devices that are CAE-owned assets and used to deliver the required T-44C student training.